This is an album of wonderful positive flow, interest, and serenity, brought to life by the effortless virtuosity of the Grigoryan brothers. Songs with Strings is the latest addition to the Hush series - which features renowned Australian musicians giving freely of their art to produce albums of gentle music, with proceeds supporting children’s hospitals throughout Australia. 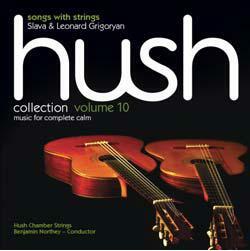 For volume 10, the Grigorian brothers once more assemble their extraordinary guitar duo, and are joined by an ensemble of string players to perform original compositions by Leonard Grigoryan and a numbner of other contemporary Australian composers, as well as arrangements by Tchaikovsky and Mompou. It’s a gorgeous collection and the guitar playing is stunning.